Robo-advisors could be wonderful. As a programmer and financial professional, co-author of this column Megan Russell knows how to code a service so clients can set up their own customized asset allocation, contribution and withdrawal schedule and tailored rebalancing algorithm to meet their specific financial goals. She currently creates those tools for Marotta Wealth Management. Combining these services with the trading capabilities of a brokerage firm like Schwab would enable clients to receive a customized service from a fully automated tool. It would be beautiful. Although this is a plausible service to offer, it is not what Schwab Intelligent Portfolios (SIPs) or any other robo-advisor to date has designed. Schwab offers a canned asset allocation generated from a risk tolerance personality quiz that forces you into a one-size-fits-all rebalancing algorithm. It ignores your contribution and withdrawal schedule and could create problems as a result. We are visionaries, idealists, who love to dream how to push the boundaries of tailored financial services. With their massive coding resources, Schwab could have done likewise. When we started reviewing SIPs, we were hoping Schwab had created a tool that would compete well with advisors who do little more than investment management. Unfortunately, Schwab didn’t achieve that. SIPs offers one service: to “build, monitor and rebalance your portfolio.” We’ve already written two articles explaining why it doesn’t do that well. Had Schwab done a better job at robo-advising, advisors and investors alike could have used the tool to automate what can be programmed, giving them more time to focus on what can’t be automated. Flesh and blood advisors using smart tools provide the best advisory services. Even if Schwab had programmed every conceivable contingency, the role of a personal advisor still brings value. Offering comprehensive wealth management means advising clients on a host of different financial topics. Advisors are like primary care physicians. They need to understand holistic wellness and direct clients toward health. They are neither dieticians nor heart surgeons, but they need to know when a referral to a specialist might be the best course of action. Robo-advisors are unable to meet this need because their coding cannot exhaustively cover every possible situation. Some aspects can be programmed, and we have tried to code the most common. But there are always more possible courses of action that could be programmed. And some topics cannot be easily modeled by a computer. Intergenerational financial planning is often too fuzzy for the computer to model. Some rules of thumb can be programmed. And there are reports that would inform the discussion. But at the end of the day, a human with a warm heart, life experience and a great deal of financial knowledge will serve you better. More examples of these services include big purchase analysis, life transitions planning, estate planning, education planning, retirement planning, employee benefit advice, insurance needs analysis, charitable giving strategies, trust management, retirement home selection and more. Money is a delicate topic where all of us have a history. Each person’s particular monetary experiences make them approach financial planning differently. Those diverse backgrounds pose specific difficulties when it comes to meeting our goals. For those of us who shy away from risk, it might take education to endure the volatility of the markets. For those of us who are nervous about spending money, it might take counseling to help us best enjoy our wealth. In these areas, a comprehensive wealth manager can help and a robo-advisor is incompetent. Even the best programmed asset allocation rebalancing tool cannot help a spender learn to save or guide a skittish investor to see the investment return through the risk. Our finances touch all aspects of our lives. We spend money on what we value. We save for our life goals. Comprehensive financial planning begins with the process of life planning and dreaming about what you want to happen. We challenge our clients to answer this question: What is the money for? We counsel them and help them think about what they value and how they can align their finances with those values. A computer algorithm cannot help you with this. An advisor is your ally in finances for a lifetime. He or she knows you, your goals, your values, your family and your finances. Despite the ups or downs life brings you, your advisor is there to face them with you. An advisor needs to know more than you in order to do what you would do with the advisor’s time and expertise. An electronic tool cannot replace that service. 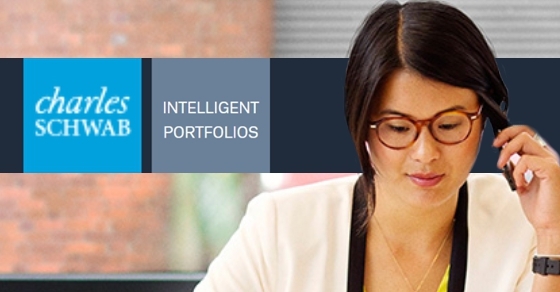 Screen captures from Schwab Intelligent Portfolios.